Moving Business Forward...Faster A part of every business is change; now more than ever, business moves at a pace that is unparalleled. Just like the ever-changing business world, so are there changes in the process of writing a textbook. Containing the most important introductory business topics, this paperback text includes the most current information available and the best supplementary package in the business. 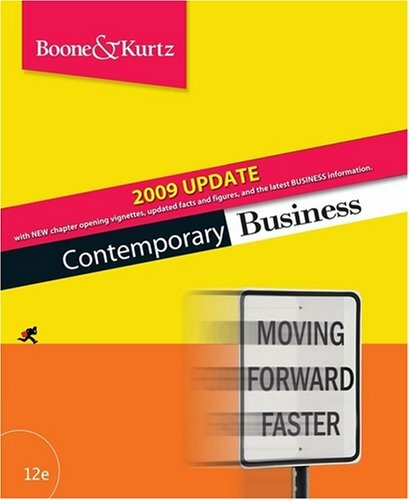 You'll find that this new updated edition of CONTEMPORARY BUSINESS 2009 gets your students excited about the world of business and helps them improve their critical-thinking skills. Opening new doors of possibility can be difficult. CONTEMPORARY BUSINESS 2009 gives students the business language they need to feel confident in taking the first steps toward becoming successful business majors and successful businesspeople.